There’s a common misconception among youth basketball athletes today that can make or break their ability to grow into a great player rather than just a good player. The difference seems like a nitpick, but it’s actually really complex and crucial. Are you ready to know the key? Alright, here it goes. There’s a major difference between working out and training. Athletes of all levels and ages should understand that there is a distinction between working out and training, and know that only through proper training can your basketball game be elevated to the next level. Working out is simply exercise, any sort of physical activity with the purpose of improving your fitness but not geared towards improving towards a specific target or goal. Don’t get us wrong: Working out is great and vital towards maintaining a proper level of physical fitness. Training is a more focused approach to working out, utilizing a goal-oriented approach through repetition, proper form, drills and more. Through a proper training plan you develop the muscle memory, fitness and high quality repetitions required of getting better and growing your skillset. When you work out, you take a wide and general approach to exercise. When you train, you set your mind towards a specific plan to get better. When you train with Hoop Dreams by Coach Mike Scott, you get real basketball training for real results. At Hoop Dreams, we know the difference between simply working out and training. Our Lexington basketball camps, clinics, club teams, leagues, group training and private training are geared towards getting REAL results and skills through a focused program. Our founder and coach, Mike Scott, knew the difference between working out and training when he hit the court as a player at Eastern Kentucky. He knew the difference when he founded Hoop Dreams in 2007. And he still knows the difference today. Our basketball camps and training programs are designed to improve individual fundamentals in a fun, competitive and energetic environment. Our club teams play in a variety of leagues, including AAU programs, around Kentucky and the region. Mike Scott is dedicated to giving your player the dedicated support, skills and proper TRAINING needed to help them stay motivated and continue to foster their love for basketball. Again, we don’t just work out here at Hoop Dreams – we train. Our training focuses on improving skill such as dribbling, shooting, passing, communicating and more. In other words, working out will help you get up and down the basketball court. Training, and especially training with Hoop Dreams, will help you learn how to utilize a crossover dribble, a low dribble, or between the legs dribbling. Working out will help you get the stamina to jump, but training will help you learn how to shoot a jump shot, free throw or 3-pointer. Working out will help you be able to pass a ball 10 feet, but Hoop Dreams basketball camps will help train you how to properly toss an overhead pass, chest pass and bounce pass. Even more, we’re fully dedicated to helping your athlete grow as more than just a player. We want all of our athletes to train and grow as teammates, using group drills and practice to emphasize one of the most important aspects of a sport like basketball. Not only will they learn how to pass, they’ll learn why they should pass, as well as how to effectively communicate and respect their fellow teammates. You can contact us today to find out more about your summer basketball camps, club teams and private training to elevate your game. Don’t just work out…Train. 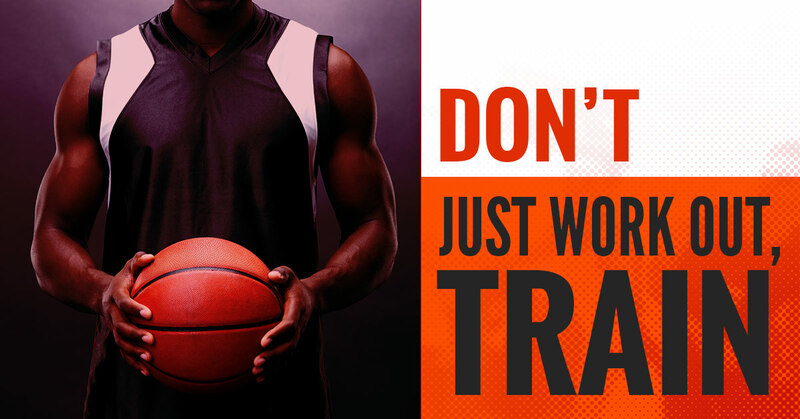 Don’t just train…Train with Hoop Dreams.